Recently, Antonino Tumeo, a scientist in PNNL’s High Performance Computing group, became a Subject Area Editor for Parallel Computing, an international journal that centers on the practical use of parallel computer systems, including high-performance architecture, system software, programming systems and tools, and applications. 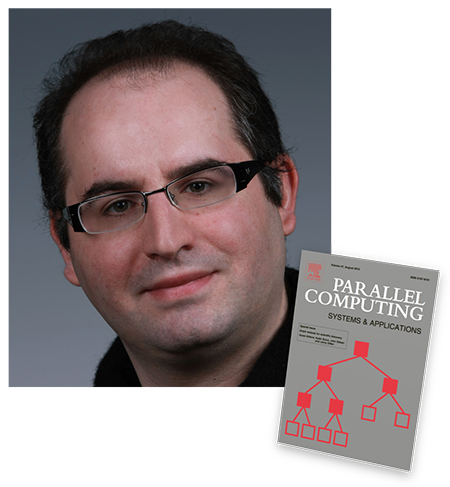 Previously, Tumeo was as a co-editor of a Parallel Computing special issue. As a Subject Area Editor, Tumeo joins a cadre of international computer science experts who serve on the Parallel Computing Editorial Board. According to Elsevier, the journal’s publisher, editorial board members are selected for their “expertise in key areas related to the journal” or for their “international presence in the field.” Typically, they serve a three-year term. Currently, Tumeo’s research involves modeling, simulation, and prototyping of HPC systems for irregular applications; general-purpose computing on graphics processing units; design and evaluation of novel architectures; and hardware-software codesign for big data analytics. Since 2011, Tumeo has co-organized the Workshop on Irregular Applications: Architectures and Algorithms (IA3), held in conjunction with the International Conference for High Performance Computing, Networking, Storage and Analysis (known as SuperComputing). In 2017 and 2018, he served as co-organizer for the Workshop at the Intersection of Graph Algorithms and Machine Learning, held with the IEEE International Parallel & Distributed Processing Symposium (GRAML’17 and ’18). In 2016, he was program co-chair for the ACM International Conference on Computing Frontiers. In addition to his work on Parallel Computing, Tumeo also has been a co-editor for other journal special issues, including the Journal of Parallel and Distributed Computing and IEEE Computer.